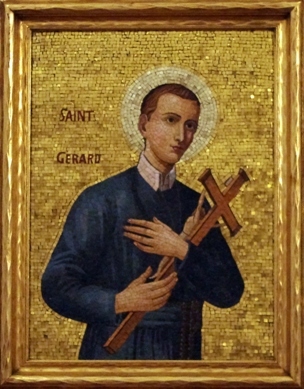 Prayer to Saint Gerard Majella for the fruit of the Womb. (The Redemptoristsand Campagnia, Italy)BeatifiedJanuary 29, 1893 by Pope Leo XIIICanonizedDecember 11, 1904 by Pope Pius XMajor shrineShrine of St. Gerard Majella, Materdomini, Avellino, ItalyFeastOctober 16AttributesYoung man in a Redemptorist habit, skullPatronageChildren (and unborn children in particular); childbirth; mothers (and expectant mothers in particular); motherhood; falsely accused people; good confessions; lay brothers; tennis ball football, head boys and Muro Lucano, Italy. NextConversion of Saint Paul, Apostle.